Tasmanian salmon producer Tassal has released its first Sustainability Report, which is 57 pages and covers a wide range of topics around the company's business. The report outlines the company's sustainability achievements to date and gives a snapshot of future sustainability initiatives across all operations, said managing director and chief executive officer, Mark Ryan. "In preparing our sustainability strategies, Tassal spent considerable time interacting with stakeholders to identify what was important to them," he said. "This level of engagement and transparency is relatively new for Tassal. But we believe it is an essential part of our business operations going forward as it will help us to continue to be an accountable and sustainable aquaculture company." Achievements over the past two years include reductions in copper antifoulants and reductions in fishmeal use. There is no question that retailers were increasingly keen to sell sustainable seafood products, and that consumers are more informed than ever about what they are buying, said Mr Ryan. "Aquaculture is widely acknowledged as the fastest growing food producing sector in the world. Tassal understands that it needs to set the standard for sustainable aquaculture, thus providing a sustainable food solution to support the global food needs of an ever-growing population." Tassal has also announced a sustainability partnership with WWF. Tox Free Solutions director Michael Humphris has indirectly sold 50,000 shares for a handy $131,219, an average price of $2.625 each. In contrast, fellow director Robert McKinnon has acquired 50,000 shares for $135,679, an average price of $2.71 each. Energy World Corporation has applied for a listing on the Hong Kong Stock Exchange. The secondary listing will expand its shareholder base and business footprint n Asia, it said. An increase in the gas price the company can charge the Sengkang Power Plant in Indonesia should add US$22 million to revenue and US$5.2 million to profit. Independent non executive director Djan Faridz has resigned. Qube Logistics has furthered its rail transport ambitions with an agreement to purchase a 55 per cent unit holding in the Moorebank Industrial Property Trust (MIPT) from joint venture partner, Stockland, for $123 million. The purchase will increase Qube's holding in Moorebank to 85 per cent with the remaining interest owned by QR National. The 83 hectare property in southern Sydney is the site of a proposed intermodal terminal and port linked industrial facility. When fully developed the intermodal rail terminal will have the capacity to handle up to 1 million twenty foot equivalent units (TEUs) per year to and from Port Botany. Managing director, Maurice James, said the key infrastructure project is critical to improving the productivity and efficiency of the freight task to and from Port Botany. "Subject to state and federal government approvals and agreement with the current tenant of the property, we believe stage 1 of the project could commence operations to Port Botany by 2014. The billion dollar project will be fully funded by the private sector." QR has pre-emptive rights under the unit holder agreement to acquire a proportionate share of Stockland's units on the same terms as Qube. If it does so, Qube's unit holding will be 67 per cent and QR's 33 per cent. QR has 30 business days to exercise its right. Qube will fund the purchase through debt and available cash. Completion is expected by the end of June. Mr James said Qube will lodge the environmental assessment (EA) of the concept plan for the project with NSW planning authorities this week. The project has already been the subject of environmental assessment as part of the ongoing planning process and the lodgement of the EA will trigger a further round of public consultation. Studies have found that the Moorebank intermodal terminal would remove more than 18,000 truck movements per week between Port Botany and Moorebank, reduce greenhouse gases and improve air quality. CBD Energy non executive director James Anderson has resigned. The board thanked him but gave no reason for his leaving. CBD said people may still turn to solar electricity to help cut their power bills despite the recent loss of the Federal solar hot water rebate. CBD has also criticized the latest ruling of the Independent Pricing and Regulatory Tribunal (IPART) into the NSW solar feed in tariffs, saying its price for selling solar from rooftops back into the grid is paltry and irrelevant for those getting cheaper solar power. Jeff Bye, who runs the solar arm of CBD Energy, said "We already know that the cost of coal fired electricity is going up in New South Wales, thanks to the involvement of IPART in setting prices. Prices went up 17.6 per cent in 2011 and are tipped to rise 20 per cent in 2012, making the differential between cheaper solar power even greater." Average energy bills in NSW now show a cost of between 20 and 30 cents a kilowatt hour, reaching 43 cents at peak, while solar energy costs between 5 and 7 cents a kilowatt hour to produce over its lifetime of around 25 years. Unlike the increasing cost of building new coal fired power stations, the cost of solar panels has been falling, helped principally by the lower cost of their main ingredient of silicon, which has fallen in price from $450/ kg in 2008 to around $25/ kg today, he said. Residential installations still have the benefit of qualifying for government sponsored small technology certificates (STCs) and their current three times multiplier. STCs contribute around 35 to 40 per cent to the cost of a solar system. This means the average cost of installing a solar system can range from $2,000 to $12,000, depending on size of system, giving payback periods of between four and eight years at projected electricity prices. Given the likelihood of further increases to electricity prices from the carbon tax, payback periods are likely to become even shorter, said Mr Bye. Mr Bye said the latest IPART ruling just entrenches the old way of selling electricity, which includes all the extra costs of transmission from distant power stations, which can be up to 60 per cent of a non-solar power bill. "The simplest formula for reducing household power bills is solar, which is now five times cheaper than traditional power, with an energy cost of 5 to 7 cents a kilowatt hour locked in for 25 years," said Mr Bye. "With solar, you've got you own power station on your roof at a fixed and certain price, so you avoid the costs of unnecessary power lines and middlemen, with the sun giving you free electricity. With the right design of a solar system, a household uses the energy it generates - you don't need to export energy to make the economics stack up. "The latest IPART ruling ignores how electricity is being sold and the Government really ought to be advising people to go solar to avoid the inevitable rising cost of traditional energy," Mr Bye said. IPART has already lifted electricity costs 17.6 per cent in 2011 and is likely to lift them another 20 per cent in 2012, with households now paying 20 to 30 cents a kilowatt hour and up to 43 cents at peak. "The new IPART rate for retailers to buy surplus electricity from households at 5.2 to 10.3 cents a kilowatt hour might be low but the cost differential between cheaper solar and traditional energy will only get bigger," Mr Bye said. CBD estimates current payback periods for installing rooftop solar are between four and eight years, after which the power is effectively free. On 14 February DoloMatrix International managing director John White acquired 1,750,000 shares through the exercise of options. The price was $525,000 or 30 cents per share. 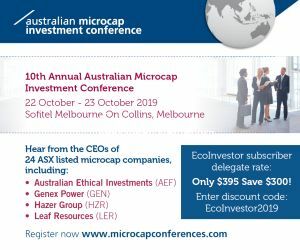 CVC Sustainable Investments is looking to sell all or part of its portfolio, with an advertisement in the Australian Financial Review calling for expressions of interest from cashed up parties. The portfolio includes a material interest in an ASX listed clean air and water and mining services company. Although not stated, this could be Environmental Group Ltd. Other assets are minority interests in renewable energy companies. Again, although not stated, and based on the Fund's web site, these could include wave energy developer Biopower Systems, run of river hydro developer HydroChile, and wind energy developer Wind Corporation. CVC Ltd chief executive Sandy Beard told Eco Investor that the Fund would like to return capital or make a distribution to investors. The manager is assessing whether there is interest in the Fund pursuing a different investment angle. This could still be in the environmental area. Expressions of interest close 27 March. With its shares suspended and at a five year low of 20 cents, tyre recycler Carbon Polymers was asked by the ASX to explain its financial position in regard to its ability to pay debts and raise capital and other matters. The company said it is seeking to raise a total $3.4 million, with an anticipated minimum of $1.9 million. The funds will be used for working capital and capital expenditure for plant and equipment. The company has also increased its production and sales significantly and with the commissioning of additional equipment will be operating with a positive cashflow position, it said. The company said it believes that its net deficiency of current assets is a short-term matter. "Some of the liabilities classified as current at 31 December are being reviewed by the directors to determine whether all or part of those balances can be reclassified as non-current at 30 June 2012. In particular, loans from related parties ($804.9k) and the associated interest ($218k) accruing on convertible notes," it said. "If those liabilities mentioned above had been reclassified as non-current, the current liabilities would have been stated at $945k, resulting in a net current asset position of $357k. Working capital, after these adjustments, would also revert to a net positive position of $209k. Certain trade payables for equipment purchases are also being renegotiated with the vendors to extend the payment terms. "Subsequent to 31 December 2011, a cash injection of $400k (loan) has been negotiated by the company. "The company's ability to remain as a going concern is expected to be addressed through the above measures (i.e., reclassification of some liabilities to non-current, together with the recent injection of cash), as well as further capital raising and expected increases in sales in the period to 30 June 2012." Carbon Polymers is preparing a rights issue in the coming weeks that will seek to raise $2 million. Based on discussions with directors and major shareholders, the board believes a minimum of $500,000 will be raised through the take-up of 25 per cent of the issue, it said. The fund are for working capital and capital expenditure for plant and equipment. The total required for capital expenditure on plant and equipment will be less than $300,000. The company has negotiated a six month delay on the settlement of the property at Smithfield and a four month delay at Fairfield, also in Sydney. Both properties have an expected completion date of June 2012. The vendors of the Smithfield property are the three major shareholders of Carbon Polymers. The company believes that a further delay of the settlement date is possible if the need arises. significantly alter the existing cashflow position, with the resulting outgoings as the owner of the property, compared to the costs of leasing the property, it said. The company is negotiating a debt facility of $1 million to be secured against the assets of the company, and this should be completed within three weeks. Dr Kevin Wong has resigned from the board. Jerry Gordon, Carbon Polymers' largest shareholder and a director of all subsidiary companies, has been appointed a director. David Groves, a director of Equity Trustees Limited which is the responsible entity of the Credit Suisse World Water Trust, has sold 190,000 units in the trust on market at 96.5 cents each. He retains 10,000 units. Mission NewEnergy said it is unable to reach a settlement with KNM Process Systems Sdn Bhd over the final handover of Mission's 250,000 tonnes per annum biodiesel plant. Mission refutes that it has an obligation to pay RM 30.5 million, around US$10 million, as claimed by KNM. Eden Energy says its US subsidiary, Hythane Company, is experiencing a surge in demand for its hydrogen-gas dual fuel, with a spike in OptiBlend sales and interest in the current quarter. In the March quarter Hythane Company has sold or delivered OptiBlend kits for use in the oil drilling industry, healthcare facilities, and manufacturing plants. The demand over the diverse industries is very encouraging, it said, and shows the benefits of an OptiBlend installation. Feedback from customers is that OptiBlend outperforms other dual fuel systems by providing faster response times to changing power demands. This can be critical for generator sets such as in manufacturing plants and oilfield. OptiBlend can also significantly extend the operational time of on-site diesel storage. When installed on a backup power system, as in healthcare facilities, the addition of the natural gas as part of the fuel mixture doubles the amount of backup time that the power system provides. This increased amount of backup time is the driving factor for OptiBlend demand at healthcare facilities, said executive chairman, Gregory Solomon. "With the dramatic increase in the US domestic supply of natural gas, largely from its huge shale gas deposits, the US price of natural gas has greatly dropped, and it is currently selling at around half the cost of diesel fuel. Consequently, in situations where larger generators are operated for more than 8-10 hours per day, very short payback times, sometimes in the order of six months or less, for the OptiBlend investment are able to be achieved." EnviroMission's shares reached a one year high of 5 cents on 15 March. Shares in European Gas fell to a one year low of 13 cents on 14 March. The company reported an operating loss after tax for the half year to 31 December of 4,061,000. The 31 December 2010 loss was 4,294,000. Panax Geothermal's shares hit an all time low of 1 cent on 13 March. Managing director Kerry Parker has directly and indirectly acquired 825,000 shares at an average price of 1.5 cents each.